Growing up in a household of 5 children in the rural Eastern Cape, Phumza relocated to the heart of Stellenbosch to fnd work and we couldn’t be happier. As the first craftswoman to join the Els & Co. family, Phumza is seen as the mother figure of the team and she is proud of her achievements. As a senior craftswoman and team leader, she warmly offers guidance and support to the rest of the team and takes new comers under her wing. With a love for team work and a natural knack for leadership, there’s no wonder why she manages to lead her team to success. With a booming laugh that echoes throughout the hallways, there is never a dull moment with her. Nonzuzo was born and raised in the Eastern Cape. She is known for taking her responsibilities as a team leader very seriously. As our second floor supervisor, Nonzuzo leads by example and keeps a keen eye on her team. No wonder she manages to seamlessly keep everyone in check. Even though all our crafters are cross trained in every skill, Nonzuzo’s heart lies with stitching, an art form which she has perfected with a smile on her face. If you come across one of our products branded with NY, you can rest assured you won’t find a stitch out of line. We strive to create an environment where work feels like home and here at Els & Co. it doesn’t matter if it’s your first day or you’ve been here for years, you are part of the team. In her own words: “We are like a family here; we laugh a lot together”. We couldn’t be happier to have Nonzuzo as one of the leading ladies and senior craftswomen here at Els & Co.
Patiswa recently moved to Stellenbosch from the Transkei, and we are happy that she found a place here with the Els & Co. family. In the short time that she has been with us she has mastered the skills of an exceptional craftswoman and risen to the rank of senior craftswoman. Despite our extremely high standards and work load, her inspirational attitude and great sense of humour makes it an inviting place to work. Patiswa never flinches in stressful situations, she just pulls up her sleeves and gets straight to work. As one of our best crafters, we are proud to announce that Patiswa is on her way to becoming a master craftswoman. Quick as a whip with comebacks, paired with a mischievous smile there is never a dull moment in the workshop. Anathi, who has relocated to Stellenbosch from the Eastern Cape, has been part of the Els & Co. family from the start and is now a senior craftswoman. Anathis’ positive attitude makes the workshop an inviting place to work, with an infectious good-natured temperament, she is an inspiration to everyone in the workshop. She maintains high standards and it shows in her high quality of work. With products of the highest quality, Anathi has heavily contributed and still continues to contribute to our outstanding image nationally and globally. Always eager to learn new skills and gain new experience we are proud to have Anathi as part of our tightly knit family. Proudly branded with 'AF' you can rest assured that your product is of exceptional quality. Born and raised in the Eastern Cape, Lumka lives in Stellenbosch with her three boys. Mothering three sons is no doubt a demanding job which would tire anyone out. But not Lumka; she is packed with energy and seamlessly manages to churn large amounts of high quality products in a day. Currently one of our senior craftswomen she is on her way to becoming a master craftswoman as Lumka accomplishes an amazing amount of work in her day. Meticulous in her work, she will work above and beyond what is asked of her because she is proud of her finished product. Branded with LV, you’ll know your product is the cream of the crop. At first glance Ethel comes across as a very serious person, but don’t be fooled by this façade. As soon as you get to know her you’ll quickly find out that she is full of jokes and laughs. With an infectious smile, she injects huge doses of humour into the work environment. Passionate about reaching new goals and achievements she has risen to senior craftsmanship in no time. She executes her duties efficiently and with grace, and of course with laughter trailing just behind her. On track to becoming one of our master craftswomen, Ethel produces products as neat as a pin. Branded with her initials EK, you’ll know that your product is of exceptional quality. Asive was born and raised in the Eastern Cape and she has happily relocated to Stellenbosch. She might be quiet as a mouse but she consistently produces products of high quality as one of our senior craftswomen. Serious about her work, she is very conscientious of the importance of the accuracy in her work and therefore her products are flawless. Asive exemplifies going above and beyond what is required. Satisfied with her high standards of work she proudly stamps her products with ‘AM’. We envision a promising future for Asive here at Els & Co.
She brings a ‘can-do’ creative, positive and friendly attitude to work every day, without fail, and everyone in the workshop can not help but be swept along. Fun to work with she brings a smile for everyone to enjoy. Even under the most demanding of work conditions, Azipheli maintains an incredible, positive attitude, which inspires others to more effectively deal with extraordinary circumstances. Highly reliable, Azipheli crafts products of the highest quality which has made her one of our senior craftswomen. She exudes a tremendous level of pride in her work and proudly brands her products with the letters ‘AJ’. If you receive any of her products, you can rest assured that you have struck gold with your purchase. At Els & Co. we strive to make anyone and everyone feel at home. Even though Thoko has only been with us for a short period of time, she fits into our team like a glove and has reached senior craftsmanship already. Born and raised in the Eastern Cape, Thokozile Mantangatanga is armed with a golden voice that can hit any note. Chances are you'll walk into our studio and hear the craftswomen singing. Not only can she hit a note like none other that keeps the rest of us singing and humming all day long, she also churns out high quality products during crunch-time. One of four siblings, Busisiwe was born and bred in the Eastern Cape. Her positive attitude is infectious and her playful character can turn anyone’s frown upside down. With Busi around we can rest assured that our studio won’t see another doldrum day on the horizon. With hands that ache to work and a can-do attitude, Busi is a fast learner and she fits perfectly into our tightly knit family of hard workers. At Els & Co. we strive for our crafters to keep growing and to constantly learn new skills of the trade. Currently a junior craftswoman, Busi is a fast learner and we envision the day she becomes an exceptional master craftswoman. For many years I contemplated a radical career change from photography and design to crafting something out of leather with my own hands. Something so well made that merely holding it and smelling the ample beeswax in its polish would enrich the soul. Something that would last a lifetime. 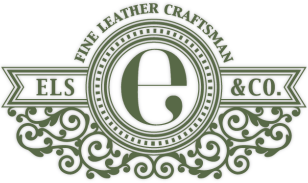 In 2014 I finally took the plunge and founded Els & Co. Fine Leather Craftsmen. As South Africans we live in a country with many social problems, and we easily overlook the amazing potential of our diverse and beautiful people. Some years ago a wonderful woman helped me realise this and it became the backbone of Els & Co. So instead of searching for skilled leather craftsmen with experience, it became our mission to source craftsmen from the millions of people in country for whom there are very few opportunities to escape the poverty cycle they are trapped in. At Els & Co. we are proud of the fact that each individual was trained in-house and has gained a very valuable skill that they did not have before. Today Els & Co. is made up of a formidable team of talented craftswomen who love what they do and give a little of themselves in every product they craft. A team I am extremely proud of and am honoured to be part of.